This post is, in many ways, not really about just the Apple iPad, but rather a broader reflection on the stage of computer technology that we have reached. The iPad, which launches in the USA today, is potentially another significant step in the development of computer technology (an easily portable tablet computer with multi-touch control, the size of a book yet with color screen, long battery life and wireless connectivity to the internet). As I mentioned in a previous post, no-one yet really knows if Apple’s new product is a winner or not (the Apple Newton, released in 1998, failed to take off). Such small devices (whether tablet computers such as the iPad, or smartphones, netbooks, etc.) have access to (potentially) all of the information that exists in the world today, at the touch of a button, some of it for free. Isn’t it amazing that we now have access to all of that in something the size of a magazine? What will this power/ability lead us to? With the exception of the inscription “Don’t Panic“, which I suppose one could always set as one’s desktop image (remember, you read it here first! ), this sounds very similar to the iPad. People have talked about whether the iPad is just a jumbo sized iPod Touch – maybe, but I suspect that extra size makes a big difference to the way it will be used. It is no accident that the typical book ended up the size it is, and the reason there aren’t more books the size of an iPod. That the iPad has come to resemble a book/encyclopedia is therefore perhaps not surprising. But the iPad and the internet are not just about access to information, but also about networking and personal interaction. The iPad will provide easy access to communications tools, and social media and networking solutions (Email, Instant Messaging/AIM, Skype, Twitter, Facebook, LinkedIn, etc.). This seems to be far beyond what Douglas Adams had considered his ultimate Guide would do. 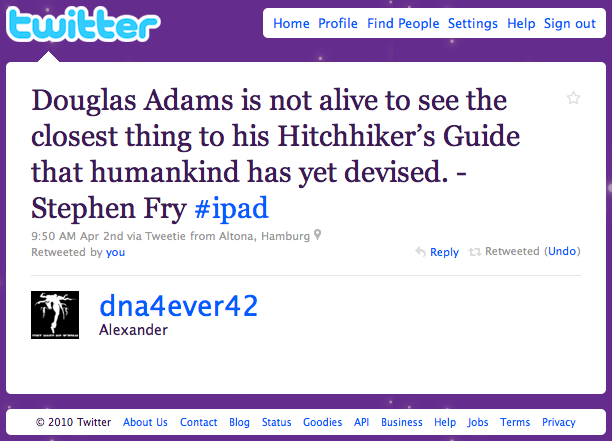 Adams wrote “The hitchhiker’s guide to the galaxy” in 1979, so it is perhaps impressive enough that he was able to foresee (and write a humorous book at the same time) so much of the development of computer technology, especially when one considers that home computers and personal computers only really began to arrive in the 1980’s (reference to ‘History of computing’ in Wikipedia). In some ways it feels like the computer has reached the end of the road, that smartphones like the iPhone and tablet computers like the iPad are the ultimate evolution of computers. They might get faster, more memory, better graphics, additional functionality such as cameras, etc. but these developments are smaller, incremental improvements, rather than step changes. This would, of course, be wrong, simply because we might not be thinking broadly enough; we are not yet aware of the next great idea to take computing in a new direction. Such developments might include artificial intelligence for example (something that Adams also talked about with regard to his hitchhiker’s Guide in the fifth book in his trilogy, ‘Mostly Harmless’, in which “the Guide Mark II”, is artificially intelligent and capable of interacting with the reader). Other developments might involve greater interaction with the person (surgically embedded computers?) or the environment (eg, the internet of things). Who knows?